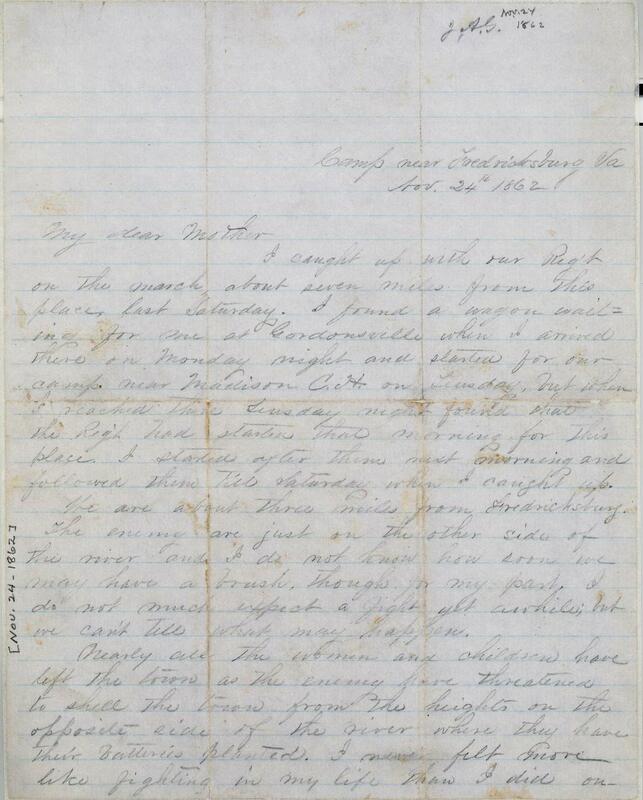 Item description: Letter, 24 November 1862, from James Augustus Graham (1841-1908) to his mother Susannah Washington Graham (1816-1890) in Hillsborough, N.C. Graham, then a corporal in Company G (Orange Guards), 27th North Carolina Infantry Regiment, described his travels to catch up with his regiment near Fredericksburg, Va., and upon arriving, his outrage that the enemy, located just across the river, had driven the women and children from town with threats of shelling. Graham also confirmed the death of George W. Woods, a private who had been wounded at Sharpsburg, and speculated about a promotion to lieutenant, which he would receive 5 December 1862. Item citation: From folder 201 in the William A. Graham Papers #285, Southern Historical Collection, Wilson Library, University of North Carolina at Chapel Hill. I caught up with our Reg’t on the march about seven miles from this place last Saturday. I found a wagon wating for me at Gordonsville when I arrived there on Monday night and started for our camp near Madison C.H. on Tuesday, but when I reached there Tuesday night found that the Reg’t had started that morning for this place. I started after them next morning and followed them till Saturday when I caught up. We are about three miles from Fredericksburg. The enemy are just on the other side of the river and I do not know how soon we may have a brush, though for my part, I do not much expect a fight yet awhile; but we can’t tell what may happen. Nearly all the women and children have left the town as the enemy have threatened to shell the town from the heights on the opposite side of the river where they have their batteries planted. I never felt more like fighting in my life than I did on Saturday morning when I met large crowds of the ladies & children coming out of the town, with just such little things as they could save in their hasty flight, run away from their homes by the Yankee scoundrels. We have issued the blankets & clothing that I brought to our men and they are now pretty well supplied except with shoes. If you see Mrs Woods tell her that her son George H. Woods is dead. He died in the hospital at Sharpsburg where we left him. One of the members of Co. B. in our Reg’t who was left there with the wounded told me that he buried him there. He did not live long after the fight but we could not hear from him until these men came over and were exchanged. I have tried on the flannel shirt you sent me by Walter Thompson. It is too long both in the sleeves and in the body, but fits very well every other way. I can pull up the sleeves and make it do very well. Our Col, Cooke, has been made Brig. Gen. I understand that our Lt. Col. also has resigned and if that is so John Gilmer will be our Col and Joe Webb Major & Whitfield from Lenoir Co will be our Lt. Col. If Singletary does resign and Joe Webb is made Major Whitted will be Capt of our Co. Dickson 1st Lt and I will be 2nd Lt and we will have to elect a 3d Lt. I do not think we will have a fight here unless the enemy attempts to cross the river and I don’t think they will do that soon. There is no news. Love to all. 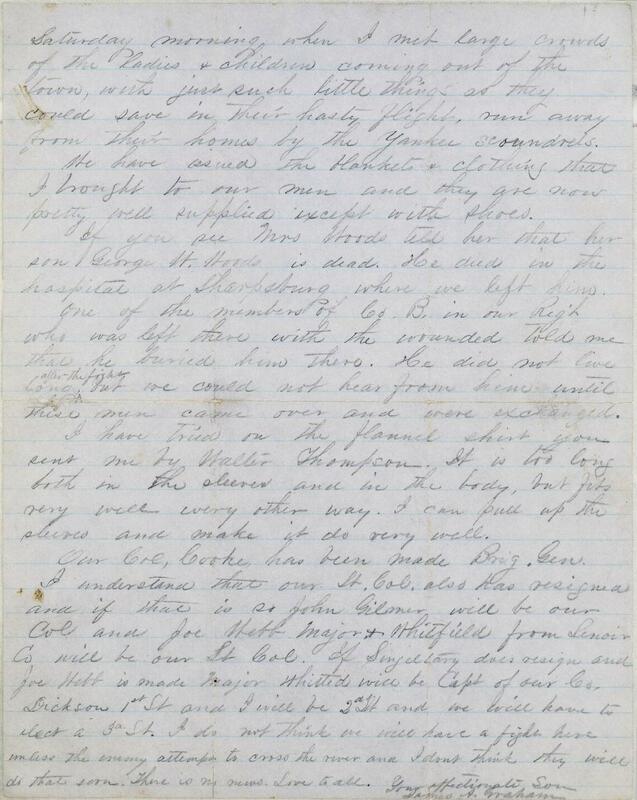 This entry was posted in Southern Historical Collection and tagged 27th North Carolina Infantry Regiment, Battle of Sharpsburg, Fredericksburg, George W. Woods, James A. Graham, James Augustus Graham, military promotion, Orange Guards, refugees, Susannah Washington Graham. Bookmark the permalink.